Alright nursing moms, let me tell you a little secret...ditch the disposable nursing pads and switch to cloth! There are many benefits to using cloth nursing pads. Not only are they a million times more comfortable, but they are better for you too! Disposable nursing pads contain nasty chemicals that you don't want against your skin. 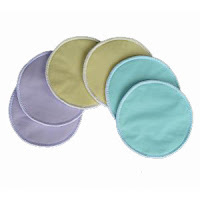 Cloth nursing pads are absorbent, anti-microbial, and easy to care for! Knickernappies nursing pads have a waterproof PUL layer to prevent the world from knowing you are lactating. An inner layer of hemp makes them incredibly absorbent. There's also a layer of microfleece to wick away any moisture and keep you dry. This is important for preventing thrush or other infections. Cloth nursing pads are easy to care for! Just throw them in the wash with your other laundry (diapers excluded). They can even be dried in the dryer. To figure out how many pads you need, it really depends on the individual. In the early days, when you are engorged, you will need more pads. You can always more often if you don't have enough pads to get you through a few days. Once your milk settles down and you are nursing your baby less during the day, you will find that one set of pads will get you through a whole day. Have you made the switch to cloth nursing pads?